Today I am doing a review on the Tarte Eye Couture Day-to-Night Eye Palette. I purchased this from Sephora while it was on sale. This palette is originally $44 and I got it on sale for $26! What a steal!! I only have one other eye shadow trio from Tarte so I thought it would be a fun idea to try out some other products from them! This deal was too good to pass up! Tarte is known for their natural qualities- they don't have any synthetic dyes and fragrances in their products which are more eco-friendly and better for your skin. Tarte can be kind of on the pricey side which is why I don't tend to purchase from them but with a price this great for 10 eyeshadows , a double-ended brush, a double-ended brown and charcoal eyeliner AND an eyelid primer.. who in their right mind would say no?! The palette also comes with a card that has two daytime looks and two nighttime looks and directions on how to achieve them. I just wanted to update you all about my upcoming plans. As most of you know, I am in school for nursing so it takes up a lot of my time. I am currently taking my LAST two classes before I can apply to the nursing program.. hallelujah!! One of which is microbiology (kill me now!!) and it is a very complicated subject. It takes a lot more studying and attention than all my other classes did. I absolutely love interacting with you all and sharing my love of all things beauty with you but I want you all to understand that school is my top priority at this point in time. Nursing has been a dream of mine for as long as I can remember. I will still be around so keep the requests and comments coming and feel free to email me at kaitlinbarros@gmail.com or talk to me through my facebook page: Blushing Beauty. I have been brainstorming on ways to get some posts up for you guys throughout the weeks and I've decided I will probably be posting a new blog every Monday and Friday (don't hold me to it just yet!) I need to make sure it will work with everything I have going on and then I will finalize it in an upcoming post! **Don't forget to follow me on all of my social media! It's all posted on the top right corner! 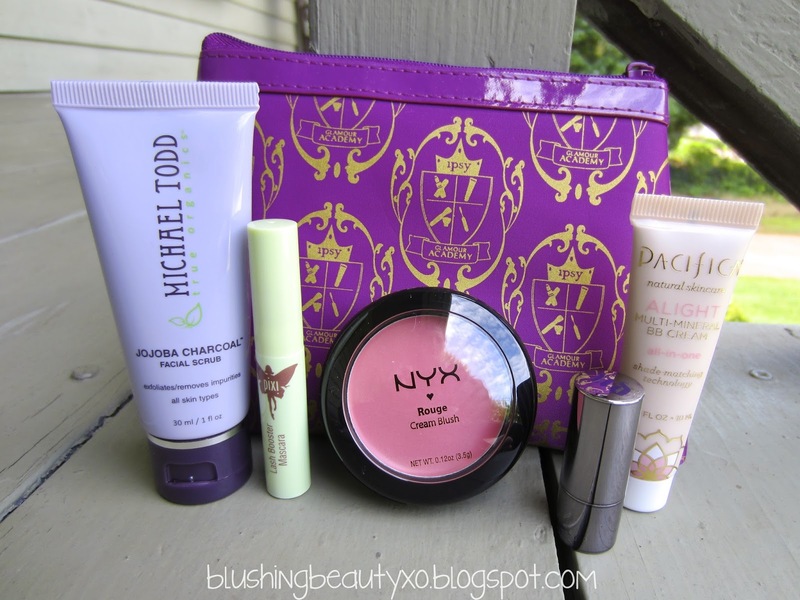 Today I am doing a review on the August ipsy bag. This months bag took a little longer than usual to arrive.. something about DHL losing some shipments. Hopefully IPSY's contract with DHL is almost up so they can move to UPS or FedEx. Anyways, this is only my second bag with ipsy and I am so pleased with what I have gotten so far! I really enjoyed this bag! This month's bag was a back to school theme - "Glamour Academy". The bag is purple with a pattern of a makeup coat of arms all over. It reminds me of Harry Potter for some reason!